Caption: Fig. 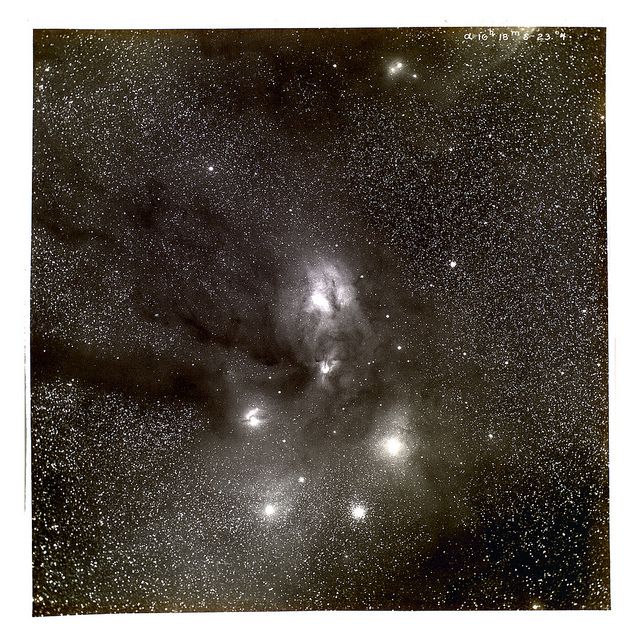 1: Astronomer E. E. Barnard photographed the Rho Ophiuchi nebula near the border of Scorpius in 1905 through a 10-inch refractor. When he published the image in the Astrophysical Journal five years later, he discussed the possibility — then fiercely debated — that bright nebulae are partially transparent and dark nebulae are opaque, hiding material farther away. Other researchers argued that dark nebulae are simply regions where stars and gas are absent. Fig. 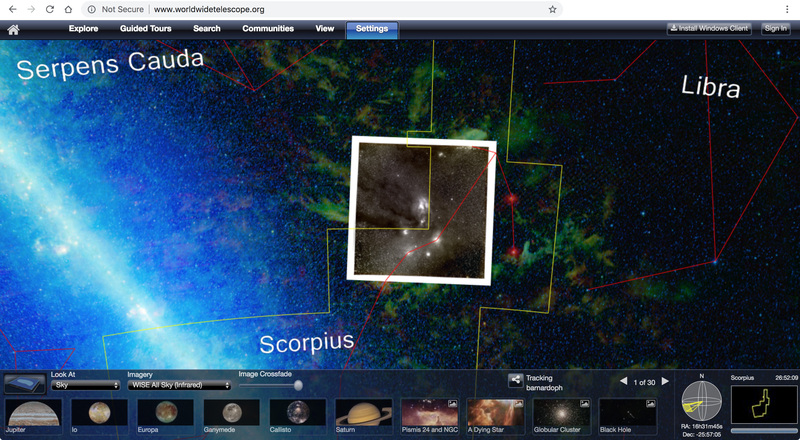 2a: Barnard’s photo has been placed on the sky in its proper position and orientation and is displayed in WorldWide Telescope (WWT) superimposed on a false-color background image from NASA’s Wide-field Infrared Survey Explorer (WISE). In Fig. 2b and 2c, Barnard’s photo has been made partially and fully transparent, respectively, to reveal it in context. In the visible-light photo, gas glows brightly while dust appears in silhouette. In infrared light, as seen by WISE, dust glows brightly where in visible light there was nothing but blackness. Barnard was right! Credit: American Astronomical Society, NASA/SAO Astrophysics Data System, and WorldWide Telescope. To play with this scene in WWT yourself, visit "The 'Paper' of the Future" by Alyssa Goodman et al. and scroll down to Fig. 7. 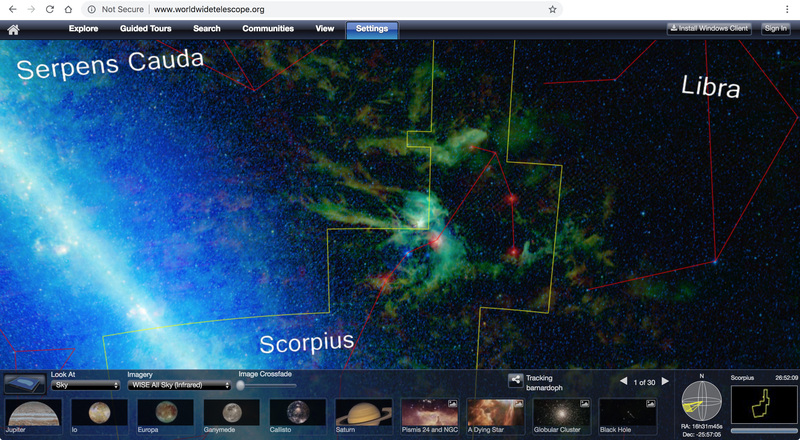 Astronomy Rewind and its partners and precursors, including the Centre de Données astronomiques de Strasbourg (CDS), have received funding from NASA’s Astrophysics Data Analysis Program, Microsoft Research, Astrometry.net, the National Science Foundation, IOP Publishing, and the American Astronomical Society. 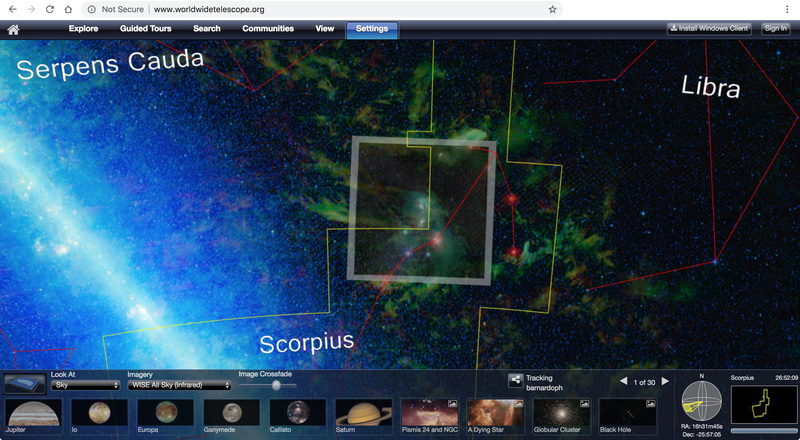 Zooniverse is the world’s largest and most popular platform for people-powered research, with more than 80 active projects across disciplines from astronomy to zoology. This research is made possible by volunteers — to date 1.7 million people around the world who come together to assist hundreds of professional researchers. Its goal is to enable research that would not otherwise be possible or practical. Zooniverse research results in new discoveries, datasets useful to the wider research community, and many refereed publications.